1. Sun Kil Moon – “Benji” – extraordinary…made me cry and laugh… powerful art and a nylon string guitar – I think it’s probably one of the greatest records I’ve ever heard. Really! 2. Mavis Staples – “One True Vine” – produced by Jeff Tweedy… beautiful, soulful… hushed, just great! 3. Chrissie Hynde – “Stockholm” – thanks to Terry Flamm for the recommendation! Neil Young sits in on a song with his great Les Paul guitar! 4. Jim James – “Regions of Light and Sound of God” – so good, weird, and cool, love the saxophone! 5. Jenny Lewis – “The Voyager” – Ryan Adams and Beck contribute… the record builds and the title track is my favorite song of the moment! 6. Sharon Jones & the Dap Kings – “100 Days, 100 Nights” – killer soul, great voice, great band! 7. 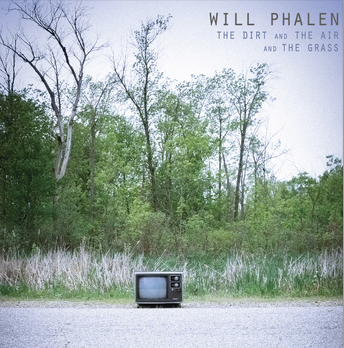 Will Phalen – “The Dirt, the Air and the Grass” – beautifully realized. Will does it all, love that Rickenbacker guitar… he’s a really cool guy too… and excellent band! Ringing guitars and haunting lyrics. 8. Nate Currin – “You and I Are Ghosts” – A great singer-songwriter, writes extraordinary songs, excellent production… I close my eyes and am reminded of the best of Ryan Adams… but Nate has his own voice… on a national tour in a motorhome… we were on a bill with him at Uncommon Ground. He just knocked us out…a cool guy too. 9. Parquet Courts – “Sunbathing Animal” – Noisy, funny, raucous. You just know these guys love Lou Reed and the Velvet Underground, and Television and Dylan too. Two voices, classic garage band vibe. But these guys are super-smart and articulate… funny, did I say funny? Love it. 10. The Handsome Family – “Singing Bones” – It was “True Detective” that compelled us to buy this one. The title song of the great HBO series is “Far from Any Road.” Beautiful and haunting. Brett Sparks owns the low tones. Gothic Country? Rennie Sparks writes beautiful lyrics… love this record! Dark. In a good way. 11. The Beatles – “Please Please Me,” – OK it was “Tune In” that made me purchase a copy of the Beatles first record. Recorded in about 16 hours. The Beatles are raw and exuberant. There are some great originals but it’s the cover songs that really knocked me out this time. I think I overlooked this one for years, thinking it was their later work that was the best. This is the Beatles as a really tight, joyous, raucous r&r band. All the elements of their later success are here. Fresh! 12. Fairport Convention – “Liege & Lief” and “What We Did On Our Holidays” – lots of people who have come out to see our band whitewolfsonicprincess have compared us to Fairport Convention. Which is just the greatest compliment! I went back to these early records. They are just amazing. Sandy Denny’s voice is one of the great instruments, and Richard Thompson is an extraordinary guitarist. We do some originals using non-standard tunings, with some Celtic, Gypsy type vibe, and I think it’s these tunes that conjure up the Fairport Convention mojo. So glad I traveled back to discover and enjoy these early discs… totally inspiring!